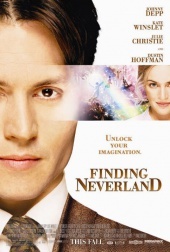 Finding Neverland is an American movie produced by Miramax and FilmColony, directed by Marc Forster, released on 4 september 2004 (USA), starring Johnny Depp as J. M. Barrie and Ian Hart as Arthur Conan Doyle. The movie is an adaptation of Allan Knee's play The Man Who Was Peter Pan. The story focuses on Scottish writer J. M. Barrie, his platonic relationship with Sylvia Llewelyn Davies, and his close friendship with her sons, who inspire the classic play Peter Pan, or The Boy Who Wouldn't Grow Up. Following the dismal reception to his latest play, Little Mary, Barrie meets the widowed Sylvia and her four young sons in Kensington Gardens, and a strong friendship develops between them. He proves to be a great playmate and surrogate father figure for the boys, and their imaginative antics give him ideas which he incorporates into a play about boys who do not want to grow up, especially one named after troubled young Peter Llewelyn Davies. His wife Mary, who eventually divorces him, and Sylvia's mother Emma du Maurier, object to the amount of time Barrie spends with the Llewelyn Davies family. Emma also seeks to control her daughter and grandsons, especially as Sylvia becomes increasingly weak from an unidentified illness. Producer Charles Frohman skeptically agrees to mount Peter Pan despite his belief it holds no appeal for upper-class theatergoers. Barrie peppers the opening night audience with children from a nearby orphanage, and the adults present react to their infectious delight with an appreciation of their own. The play proves to be a huge success. Because Sylvia is too ill to attend the production, Barrie arranges to have an abridged production of it performed in her home. She dies shortly afterward, and Barrie finds that her will is to have him and her mother to look after the boys; an arrangement agreeable to both. This page was last edited on 27 July 2016, at 00:00.